Springtime. Birds coming and going. Brian coming and going, but not birding very much. It is always a struggle to get out in March and April because of school activities. But, I have snuck out a few times the past few days. We have a Screech owl in the front yard and I hope to search for a nest soon. Whip-poor-wills have been around for a few weeks. Today down the nearby power line I scored FOY Indigo Bunting, Blue Grosbeak and Summer Tanager. The Louisiana Waterthrush has been singing out back for about a week, and Sheree’ had American Redstarts in the yard today. Winter birds are getting scarce. I did not see or hear White-throated sparrows, Juncos or Kinglets today, but some Yellow-rumped Warblers are still around, singing up in the trees. Looking forward to the Spring Bird count Sunday. 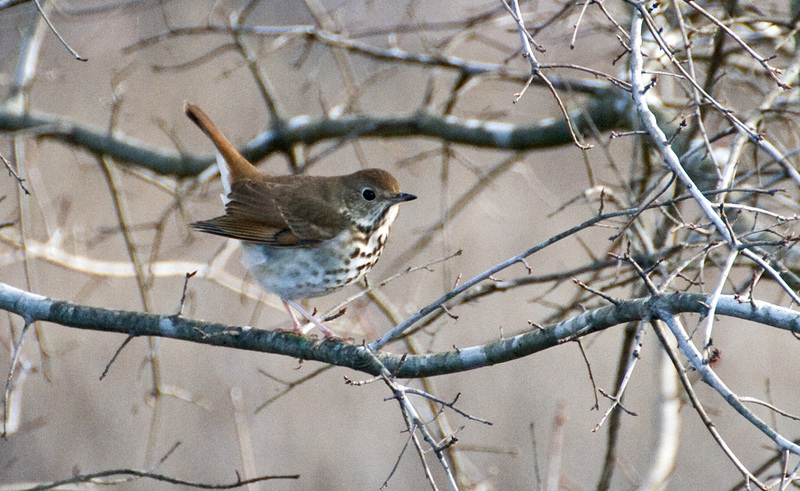 Hermit Thrush at Brickhouse Road last February. Here is my 2014 list for Durham County, as of April 24. 66 species. Durham, North Carolina, Piedmont. Bookmark.